Each year, hubby and I rotate who plans the anniversary date or event. This year, he had event-duty which left me with getting him a gift (nothing too elaborate, of course). I decided rather than wrap his gift, I'd make him work for it. 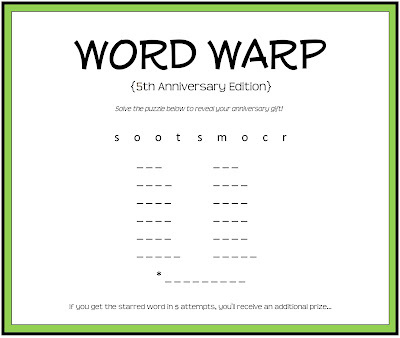 There is an app on our iPhones called Word Warp that we've both been into lately, so I warped the letters of his gift and watched as his mind went to work! Once he solved it, his anniversary gift was revealed: Tickets to a Freestyle Motocross Show! ....you've gotta put a little excitement ahead of a gift like this. Although it's something he may REALLY want (he's been asking for 5 years to go to a motocross show with me), it's pretty boring to just hand over some tickets or something of the sort. You don't have to do word-warp, of course, but get creative in doing something personal to both of you. Make a mini-event of it and it's sure to be more fun...for both of you! I'd love to hear your ideas, of course, so send your tips and examples my way! That's very fun! Thanks for the idea! This is such a cute idea! I love making him work for the gift...I remember on my husband and my first anniversary (as a dating couple, six years ago), I made him go on a scavenger hunt. I don't even remember what was there at the end, but he had fun trying to figure it out! Thanks for posting! My husband and I both really enjoy crossword puzzles- we spend the weekends competing to solve the NY times and WS Journal puzzles. For our 5th anniversary I made up a puzzle filled with clues about our life and hints about his gifts. It took me at least two weeks to make the crossword- but I had fun doing it, and he had fun solving it! You might be eligible to get a Apple iPhone 7.